Have you heard of Vipassana? Those ten-day silent retreats? I once heard it described by an acquaintance as a ‘bunch of zombies walking in straight lines very slowly and not looking at each other and then sitting starring into space for a few hours before eating boring food very slowly together while gazing down at their plates’. I am a fan of Vipassana, so, personally – I don’t think he got it! But what if there was another way to disconnect from the outer world and go inwards, that wasn’t quite so extreme? If you are looking for some time-out but not so silent, then a 3-day retreat (2 whole nights of bliss!) at Happy Buddha may just be the thing for you. It is surprising how little time we really need in order to step off the merry-go-round of every day life and check in with our inner selves. Just coming out of the city and into the bush, your soul is already more at peace, because, well, instead of traffic jams you are surrounded by trees, and instead of city noise – cars, people, trains, etc. you are listening to the sound of the birds. In the early morning it might be warbles of the wattlebirds and honeyeaters, at lunchtime you may here the cackle of a happy kookaburra or the melodious songs of family of curious magpies, and in the evening it might be the gentle hoot of an owl send you off to sleep. Just this nature connection will automatically calm your sympathetic and parasympathetic nervous systems, and your whole body will let out a gentle sigh of: ‘Yes, this….thank you!’. Add to that an invigorating (though entirely optional) program of morning and evening yoga, punctuated by breaks for the consumption of delicious vegan and vegetarian food, elevated by a fun and engaging drumming workshop and with enough pauses for relaxing walks down to our hidden oasis (a secret cave and waterfall at the bottom of a ravine), it would be almost impossible not to feel your whole being drop into bliss. 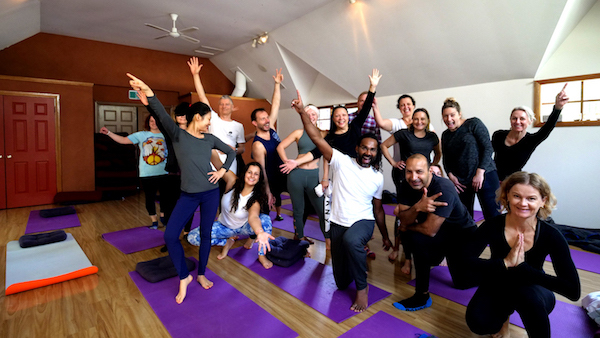 And that’s what a lot of our guests report: a feeling of bliss and happiness coming from our sweet spot combo of connecting with self – through our yoga and meditation practices – and connecting with others at the drumming workshops and around the meal table and on walks out in the nature. It’s amazing how much difference making an intention – whether it is for the year ahead, the next week or the next hour ­– can make in our experience of life. What if you made an intention right now to lovingly let go of each and every negative thought that arrives in your mind space, so that you are filled with only uplifting and life affirming thoughts? Whether the negative thoughts are directed at you or someone else makes no difference, just try letting them all go. And what if you made an intention to give yourself the gift of a weekend away from your regular life so that you could really concentrate on that practice and become an expert in uplifting thoughts? Maybe you are looking for just a one-day retreat somewhere in or near Sydney, because you think you can’t spare more time than that from your busy schedule? But what if the busy-ness was actually a part of the problem? What if it wasn’t so much the ‘number’ of things on your plate, but the state of your mind as you go through your day that was the issue? If you have busy-mind switched on a lot of the time, then you are going to feel like there is never time for anything. The thing is; this is not ‘reality’, it is more just a mind state where you are stuck in a state of reaching towards the future and ‘getting the next thing done’ so that you are not able to really enjoy the present moment. If this is you, then the very idea that you can’t spare more than a day out of your normal schedule might actually be the problem. Why not give your mind, and yourself, a real mini break so that you have enough time-out to let go of the busy mind and check in with your deeper self? It is actually the times when we feel we absolutely cannot spare the time to go on retreat, that we really need it most, because oftentimes it’s actually our mindset that is the problem, not the supposed ‘reality’ (that our busy mind created) of ‘too many things to do’. We have run ourselves so ragged that we have forgotten our basic and most sacred duty: the duty of taking really good care of ourselves. To give you an idea of what awaits you at Happy Buddha retreat, here is our retreat schedule for Day 2 of your 2-night, 3-day retreat. As you will see there are plenty of gaps for reading, relaxing by our open fire, or just doing nothing: what a relief from busy-ness just that can be. We invite you to take this opportunity to take really good care of you by booking your beautiful self into a mid week or a weekend retreat at Happy Buddha. We are located in Wentworth Falls in the Blue Mountains, just a short and relaxing train ride or an hour and a half drive from central Sydney. We will happily spoil you with our nourishing yoga sessions, our laughter-filled drumming workshops, and our made-with-lots-of-love-and-good-thoughts vegetarian and vegan cuisine. Our native birds will lighten your soul with their songs, our trees will embrace you and ground you with their ancient wisdom and very earthy stability and our facilitators will hold the space for you to do what you do best: be your fabulous self.